Documents offers mobile access to all your files, across your servers and cloud storage products. 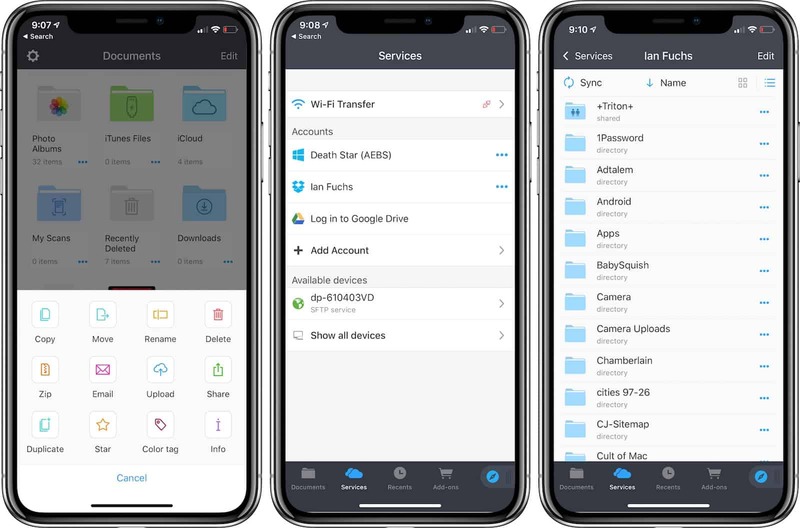 Documents is a file management app for iOS, designed to allow you to access files in a variety of cloud services. Much like the Files app, Documents allows you to access, view, and manager files in Dropbox, OneDrive, Google Drive, iCloud, and more. One of the best features of Documents is the ability to access an in-home server, NAS, or other computer’s files. Adding personal file server connections is as easy as making an FTP or SMB connection to your file storage and signing in. This means you can browse a Time Machine or Base Station drive with Documents, making it easy to work with files across devices in your home or office network. Documents lets you view, edit, and share files across services, making it easy to get work done on iOS. Another powerful feature of Documents is their web-based WiFi Transfer. By simply using your iOS device to scan a QR code on your computer, you can instantly create a secured connection to transfer files to or from either device. While it’s not a quick and simple as AirDrop, it does allow you to transfer files into a specific location on either device. The final reason Documents is a must have app revolves around the iPad. Thanks to split view on iPad, and the ability to run two apps side-by-side, it is excellent for pairing with the Files app. This allows you to quickly drag and drop files between services, or rearrange files at the touch of your fingers. The app is also useful for pairing with an email application, word processor, or presentation app, as it allows for easy insertion of cloud-based content in your working document. If you’ve ever considered trying to be more productive with iOS, you need to try Documents. Anybody that has ever wanted to manage home or office network files from their iPhone or iPad will also appreciate what Documents has to offer. Documents is hands down the best file management app for iOS. If offers a substantial upgrade to the built-in Files app, and makes for a great experience when it comes to dealing with files and folders on the go.